January 15, 2012. Two weeks and one day into the new year. I will celebrate my 50th birthday this year; become an 11-year cancer survivor; my daughter will turn 13 (yikes!) and my youngest son will turn 10. Everyone in double digits this year…and my husband doesn’t often let me forget that he is the younger of our duo. I’m not sure if it’s the thought of turning 50 or simply another small step in this journey towards ‘maturity’, but I’ve been pondering (definition: “To reflect or consider with thoroughness and care”) a lot about my life. 50 doesn’t seem possible. When I was a teenager my grandparents were in their 50s! High school graduation seems like five years ago, not almost 35; my first really good job and the cute little sports car I bought as a reward; my first apartment and the terrible furniture that I thought was fabulous because it was mine. Weddings, vacations, funerals, spades parties that lasted all weekend, and babies. I am married to a man who loves his family more than his own life and we have three absolutely amazing children: handsome boys and a beautiful girl, they are smart, quick-witted, and kindhearted. I thank God daily for giving me children who bring me such tremendous joy. And just enough aggravation that I want them to grow up and leave someday! All kidding aside, I realize that I’m probably in the last half of my life – and if I take after my maternal grandmother it will be a long half! She will turn 97 in May of this year. In another 50 years, there won’t be too many people on planet Earth who remember me. In another 100 years, the only remnant of my ever taking up space will be a headstone on the cemetery plot bearing my name. So what do I want to do with what’s left of my years? 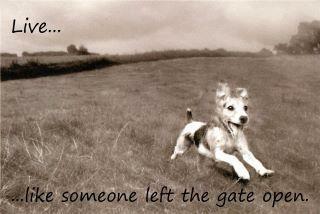 I have a few ideas: not quite a bucket list, but some thoughts on making every day an opportunity to “live… like someone left the gate open”. ~ I want to have fun with my kids – it’s easy to get caught up being a parent and forget that our kids are wonderful people. I want to see the world the way they do: full of opportunity, excitement, and adventure. My daughter tells everyone when she graduates she’s going to backpack across Europe with a friend. Wonderful! I hope she gets to do exactly that (and I hope she skypes me from every city and town). My youngest son told me recently that when he goes to college he wants to “do math and football”. Very cool. Go for it, little man – your Daddy and I will be loud and proud on the sideline. ~ I want to have fun with my friends – I’m learning the value of spending time with my friends not because we ‘need to connect’ or catch up, but because I LIKE THEM. Sounds goofy I know, but it’s so nice when there’s no agenda. Whether we laugh, go shopping, catch a movie, or fantasize about being “Thelma and Louise”, I want to hang out for the simple pleasure of hangin’ out. ~ I want to take more walks in the rain -I used to love to do this. Somewhere along the way I forgot the simple joy of getting soaked. And jumping in puddles. ~ I want to take more pictures – of everything that I find beautiful and interesting. Leaves on a tree, a fencepost, children playing, flowers in the Spring, snow in the winter, my family around the dinner table. ~ I want to dance – whether in the den, the kitchen, the car, or from the bleachers at a baseball or football game, I don’t want to be afraid or embarrassed or intimidated. In the words of my sweet Southern friend Miss Marian, I don’t want to die with any music left in me. ~ I want to become a published author – this one definitely qualifies for the bucket list but oh, I want it so badly and I’ll never know if I don’t take a huge step in that direction. These things, and many more that make us feel alive, get our blood pumping and our heart racing, are the equivalent of living like someone opened the gate. Think of all the fun we’ll have if we do it together!